What is a Smart Handpump? Smart Handpumps are applying the latest scientific advances to tackle the enduring problem of delivering reliable drinking water supplies in Africa and Asia. The pump is ‘smart’ because it houses a simple and inexpensive transmitter in the handle so usage and groundwater levels can be monitored remotely. In partnership with our funders, UNICEF, government, enterprise and local communities, we aim to improve drinking water security for millions of poor people. The text below appears on the information board next to the research handpump installed in the carpark of the University of Oxford's School of Geography and the Environment. Developed by researchers from the School of Geography and the Environment and the Department of Engineering Science, the Smart Handpump has an accelerometer, microprocessor and GSM transmitter installed inside the handle of the pump. The accelerometer measures the motion of the handle, the microprocessor calculates the volume of water pumped, and the transmitter sends out a regular SMS containing data on pump handle movement to be stored in a central database. Why is a handpump in the carpark? 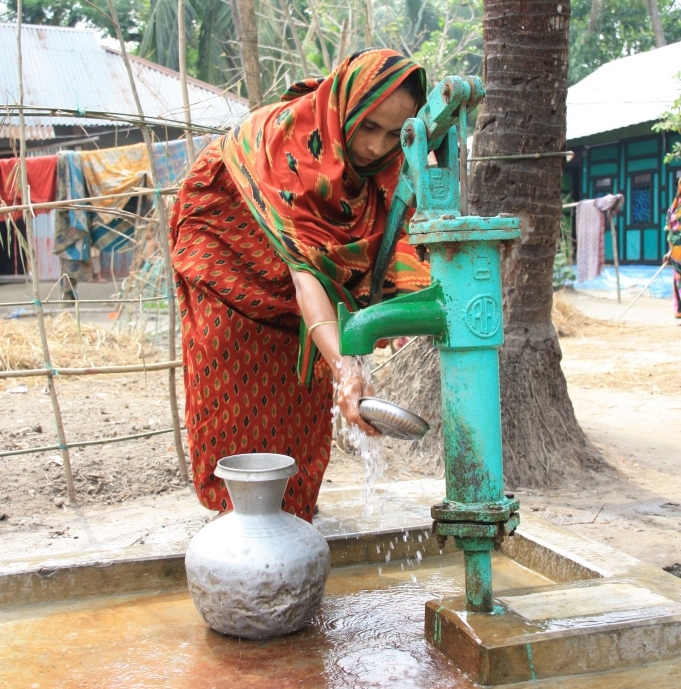 Millions of rural people use handpumps every day to lift groundwater for drinking, washing, bathing, laundry and watering crops or livestock. Groundwater is generally of good quality, widely available and of low cost, buffering dry spells where few if any alternatives are available. However, handpumps break and stay broken for weeks or months with women and girls often facing significant hardship and expense to find more distant and often dirtier water. ​• Fixing pumps fast: Data sent from the pump can alert a local maintenance company that it needs fixing. We set up a local company in Kenya (FundiFix Ltd.), powered by the data, which has reduced pump downtime from over a month to less than three days. The communities value the service and many now subscribe, paying a monthly fee to receive professional maintenance services. • Value for money: Hundreds of millions of pounds are invested each year by government, enterprise, investors, NGOs and the public trying to help poor rural communities access drinking water. Objective and timely data show if we are investing well and helping those most in need. A continuous flow of monitoring data may cost a little more but is preferable to no information, self-reporting without verification, or occasional visits. 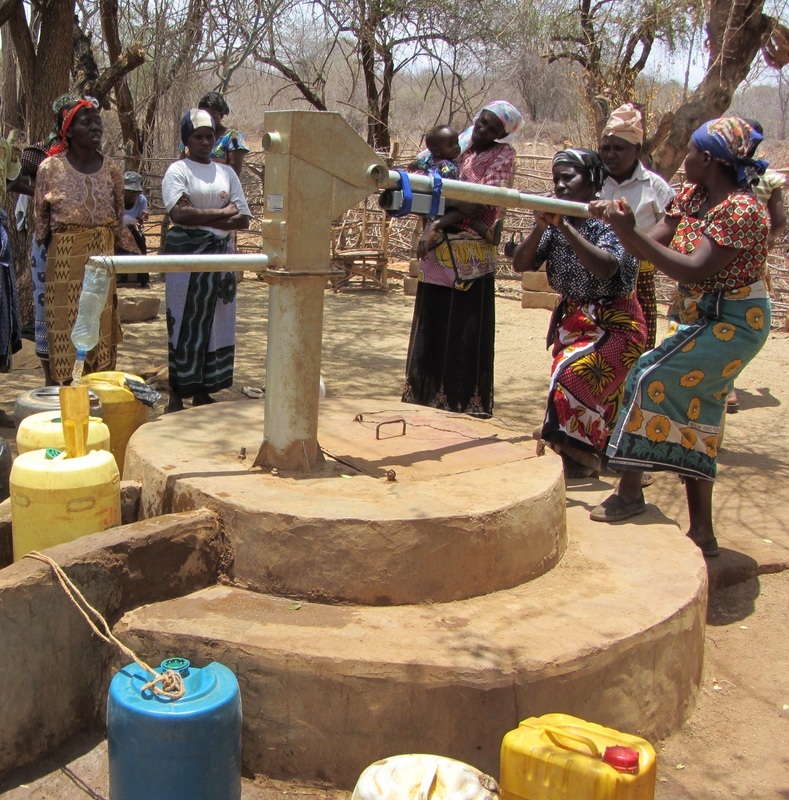 • Impact investing: We find no two handpumps are used the same. Demand varies from community to community, from schools to clinics and from wet season to dry season. Smarter data allow governments and investors to make better decisions when managing existing assets or planning new infrastructure investments to ensure better services for all at lower cost. The top line of this graph shows the basic signal obtained from the smart handpump accelerometer. On the downstroke, the pump handle accelerates and judders as the water is lifted up the rising main inside the pump. On the upstroke, the pump resets, and the motion of the handle is smoother. 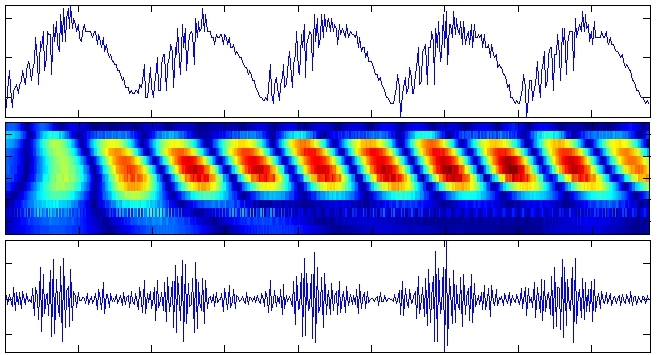 The other figures show derived data from the original signal, which can be used by machine learning algorithms. • Predictive maintenance: Changes in pump dynamics and the subtle reactions of users produce a signal which can provide information about the deterioration of pump mechanics and predict imminent failure. Forecasting failure rather than merely detecting failure once it occurs helps to reduce the downtime of systems; ideally predictive maintenance can take place to avoid downtime completely. Using machine learning this approach is already widely used in many fields, from aircraft jet engines to patient monitoring in health systems; we are now using a similar approach to monitor the condition of handpumps in rural villages. • Monitoring groundwater level: The same signal and machine learning process is also being used to estimate depth to the aquifer, i.e. the depth of the water level beneath the land surface. The ‘accidental infrastructure’ of handpumps in rural Africa and Asia could become a distributed monitoring system providing data to address the significant groundwater data deficit in these regions. This work is part of the development of a Groundwater Risk Management Tool in the Gro for GooD project in Kenya within the UPGRo programme. • We know who you are! Different pump users (e.g. men, women and children) produce different signals when they pump. User ‘fingerprints’ emerge due to differences in height, weight, strength or rhythm. Knowing if children are pumping water rather than attending school might be helpful information. More specifically we need to separate variations in pump and user characteristics from other effects to improve the accuracy of groundwater level calculations. Clearly we’re not doing this alone! In 2010 we won a small grant from the UK Department for International Development (DFID) under the New and Emerging Technologies (NET) programme. This led to wider support under a portfolio of major Research Council grants (NERC/ESRC/DFID UPGro Catalyst and Consortium Grants: Groundwater Risks and Institutional Responses for Poverty Reduction in Rural Africa - NE/L001950/1, Groundwater Risk Management for Growth and Development - NE/M008894/1; ESRC/DFID Joint Fund for Poverty Alleviation Research: Insuring against Rural Water Risk in Africa - ES/K012150/1; New Mobile Citizens and Water Point Sustainability in Rural Africa - ES/J018120/1; Mobile payment systems to reduce rural water risks in Africa - ES/N000137/1). Researchers have also been funded by the EPSRC and the Worshipful Company of Water Conservators. ​The REACH programme is advancing this work in global, regional and national partnership with UNICEF offices in Bangladesh, Ethiopia and Kenya. Separately, UNICEF has funded projects on Rural Water Sustainability in East and Southern Africa and the predictive maintenance work illustrated here. We also partner with national and local governments in our study countries to co-design policies and models which are locally relevant and supported by water users to promote sustainable outcomes. Colchester, F.E., Greeff, H., Thomson, P., Hope, R. and Clifton, D.A. 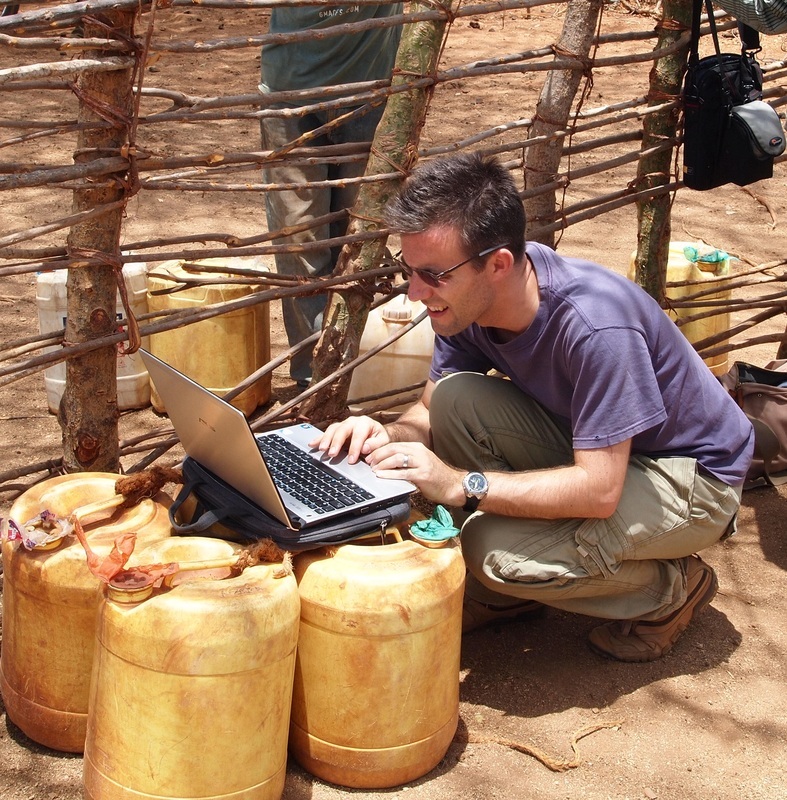 (2014)Smart Handpumps: A Preliminary Data Analysis. IET Appropriate Healthcare Technologies (AHT), London, 2014, pp. 1-4. Koehler, J., Thomson, P. and Hope, R. (2015) Pump-priming payments for sustainable water services in rural Africa. World Development, 74: 397-411. Thomson, P., Hope, R.A. and Foster, T. (2012) Is silence golden? Of mobiles, monitoring and rural water supplies. Waterlines, 31(4): 280-292. Thomson, P., Hope, R.A. and Foster, T. (2012) GSM-enabled remote monitoring of rural handpumps: A proof of concept study. Journal of Hydroinformatics, 14(4): 829-839. Distributed Monitoring of Shallow Aquifer Level using Community Hanpumps| September 2015 | Briefing Note | Patrick Thomson, Heloise Greef, Farah Colchester, Dr David Cilfton and Dr Rob Hope. From Rights to Results in Rural Water Services - Evidence from Kyuso, Kenya | March 2014 | Dr Rob Hope, Patrick Thomson, Johanna Koehler, Dr Tim Foster and Mike Thomas.